Jimmie and Stevie Ray Vaughan on the cover of Family Style. After months of fundraising and public campaigning, Dallas is drawing closer to the building of a monument honoring Jimmie and Stevie Ray Vaughan. A private fundraising effort to complement the city’s stake in the public art project fell about $7,000 short of its $68,000 goal, but things are moving ahead, according to Kirby Warnock, the filmmaker and Oak Cliff Foundation board member who spearheaded the effort. The city hosted a public meeting this week to gather community input for the Vaughan brothers artwork, which would stand in Oak Cliff’s Kiest Park, just blocks from where the two legendary guitarists grew up. A call for artists and design proposals will go out at the end of the month. There’s a PowerPoint outlining the process and the long way to go — Once an artist and design are settled on, an exact location picked, and a construction contract finalized, it will still be another 12-18 months before anybody’s having a picnic under the granite shadow of a Vaughan brother. A panel of qualified folks (including Warnock, who has already promised Jimmie he’ll make sure this thing won’t look weird) and the public art committee will decide on the artist and the eventual proposal, but the all-important “community input” will factor in at almost every stage. That’s why you, community members, are asked to send your ideas to [email protected]. 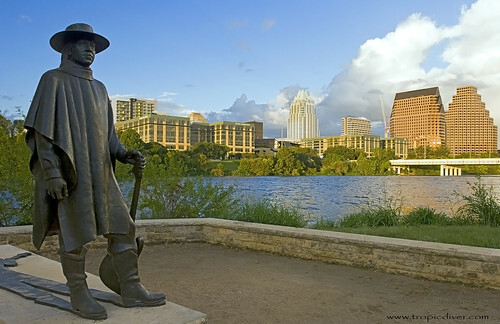 Whether it’s an indelible image of Jimmie and Stevie Ray that would make for a really killer statue, or a 5,500-word treatise on why Stevie Ray Vaughan’s “Little Wing” is the best “Little Wing,” that’s the place to share. As a community member, I happen to have some ideas myself. The artwork could be tasteful and iconic, like the cover of Family Style. It could be meaningful and adorable, like this childhood photo (courtesy of Martha Vaughan) showing the young Vaughan brothers playing guitars in their Oak Cliff home. But a city that gives harbor to Big Tex shouldn’t be tasteful or restrained in its public art. It should be bold, and unafraid of seeming ridiculous. It should be electric, and confused about its iconography. It should be massive, the size of a Texas ego, as needlessly large as the television screen at the Cowboys’ stadium. It should thumb its nose at Austin, that wannabe music capital that’s vacuumed up so much of our fair city’s cultural talent and claimed the Vaughans with its own puny memorial to Stevie Ray. It should be Dallas. An artist’s rendition of our proposal for a new Vaughan Bros. artwork in Kiest Park. Illustration by Chris Green.